We all experience “Six degrees of separation” in the most surprising of ways – you might call them Byzantine – on a regular basis. But my “six degrees of separation” experience today should not have been such a surprise. I dropped into the “Hole in the Wall,” a most unusual pub in a laneway off High Street in Kilkenny to see an exhibition that is part of the programme for the Kilkenny Arts Festival. I have been in this unique pub in the past, usually with visitors from abroad who love being taken around Kilkenny. But those visits seem always to have been late at night, with little opportunity to see it in the daylight. The Hole in the Wall at 17 High Street is the inner house of a Tudor mansion built in 1582 by Martin Archer, a future Mayor of Kilkenny. The family lost everything in 1654 with the Cromwellian confiscations, and the Archer complex became part of the Ormonde estate after 1660. The family connection is distant, but nevertheless a family connection. The mansion was let independently from the inner house and an 18th century tenant of the inner house was Judith Madden, mother of Edmund Madden who married Jane Comerford in nearby Saint Mary’s Church in 1781. The Elizabethan building with its tavern, snug and Archer room has been fully restored over the last 10 years and is open to visitors and used for exhibitions, private parties, functions, conferences and music, with visits by Juliet Turner, Maria Doyle Kennedy, Donal Dineen, Don Mescall and Liam Ó Maonlaí. It gets its name because at some time in the 18th century, in order to gain access from the High Street to the rear of the inner house a hole was punctured in a wall. By the late 1700s, this was a supper-house of renown, frequented by the Earl of Ormonde and his guests such as Henry Grattan, Sir Jonah Barrington andCaptain Arthur Wesley, later the Duke of Wellington. The building is still typically Tudor in style with a tall pitched roof, cut-stone hooded Elizabethan mullioned windows, original flagstones, hexagonal chimney and oak doors. The inside consists of an upper floor and small gallery that was the living apartment of the Archer family. It has been restored largely as found and fitted out with a 16th century oak floor and furniture sourced both locally and in Oxfordshire. This main room measures about 20 x 20 feet. The ground floor is divided into a rustic tavern made from 1582 oak beams, floor boards and other original oaks. A snug room is adjacent to this, and there is a small rear yard and an enclosed New Orleans-style courtyard. The restoration has been a heart-felt project for Dr Michael Conway from Limerick, who studied medicine at Oxford University, found his way to Kilkenny in the late 1990s to take up a post at Saint Luke’s Hospital. He bought the house without knowing what the future would bring. John Comerford from Gowran and Michael Conway had been deep in conversation. Within seven minutes all six of us in the bar knew many people in common. It was living proof of the theory of “six degrees of separation. Two of us were in Kilkenny today [15 August 2015] for the Kilkenny Arts Festival and a lecture in the Parade Tower in Kilkenny Castle by Alexander Lingas, uncovering the lost traditions of Byzantine music. He is the founder and Artistic Director of Cappella Romana, and he took us in search of the sacred music that was heard in Hagia Sophia, the great church built by the Emperor Justinian, in the same century in which Saint Canice founded his monastic settlement at Kilkenny. Outside, in the grounds of Kilkenny Castle, I bumped into a large group of parishioners from Saint Bartholomew’s in Ballsbridge, Dublin, who were visiting the cathedrals of Kildare and Kilkenny. After lunch in Café Sol in William Street, two of us went to see the restored mediaeval gardens at Rothe House. The Rothe House Garden is a recreation of an historic garden from the 17th century, and is the only urban garden of this period that is open to the public. It was officially opened by President McAleese in 2008, but this was my first visit to the garden. The walled garden is divided in two. The Lower Garden is planted with the vegetables and herbs that would have grown in the 17th century. These include Deer Tongue lettuce, Scarlet Runner beans, Gortahork cabbage, Mammoth leeks, Lovage, Borage and Lady’s bedstraw. The Upper Garden or Orchard has a wide range of fruit trees, including apple, medlar, quince and damson. The apple varieties include Blood of the Boyne and Scarlet Crofton. Surrounding these plants, the flowers that blossom throughout the year include Sweet Rocket, Calendula, Rosa Maiden’s Blush and Hollyhocks. While we were there, the artists Anne Cleary and Denis Connolly invited us to join in with “Meta-Perceptual Helmets,” an arts based workshop, was taking place as part of the Kilkenny Arts Festival. Here was an opportunity to see how the world looks to a hammerhead shark, with its hyper-stereo vision, a horse, which has exceptional peripheral vision, or a chameleon, which can look backwards and forwards at the same time, or a giraffe. “Meta-Perceptual Helmets” is an innovative and interactive exhibition that meets one of the greatest challenges in art – to make us see the world afresh. On the way back up High Street, I was delighted to see that a restaurant has opened once again in The Butterslip. We stopped for two glasses of wins in Petronella, which was opened by Frank and Marian Curran just over a year ago. The great stone house in the Butterslip was originally built in 1602 by Alderman Nicholas Langton, in 1609, and is an equivalent in many ways both of Rothe House, at the other end of High Street, and the Archer Mansion which now hosts the Hole in the Wall. My direct ancestor, William Comerford moved into the Langton House at The Butterslip, Kilkenny, after the marriage of his son James to Anne Langton in 1754. James was an older brother of Edmund Comerford (1722-1788), grandfather of my great-grandfather, James Comerford of Newtownbarry (Bunclody), Co Wexford; James was also the father of Jane Comerford, who married Edmund Madden of the Hole in the Wall in Saint Mary’s (Church of Ireland) Church, Kilkenny, on 6 September 1781. William Comerford died about 250 years ago, around 1765, while his son James Comerford of the Butterslip died around 1809. As two of us sat down in what may have been their dining room and sipped two glasses of wine, we were sitting where my ancestors may have dined 250 years ago – and all because we had come to hear some Byzantine liturgical music from centuries before that. I am in Kilkenny this morning [15 August 2015] for a lecture by Alexander Lingas on ‘The Lost Music of Byzantium’. The lecture in the Parade Tower is part of the programme of this year’s Kilkenny Arts Festival. As this year marks the 150th anniversary of the birth of WB Yeats, the ideas for the lecture as inspired, in part, by Yeats’ great poem, ‘Sailing to Byzantium,’ and is one two talks exploring visions of the great city. In this morning’s lecture, Alexander Lingas uncovers the lost traditions of Byzantine music. When Constantinople fell to the Ottomans in 1453, sacred Byzantine chant was almost lost and forgotten in the West. Lingas is the founder and Artistic Director of Cappella Romana, an ensemble celebrated for its recordings of this repertoire. He promises to take us in search of the sacred music that was heard in Aghia Sophia, the great church built by the Emperor Justinian in the same century in which Saint Canice founded his monastic settlement at Kilkenny. The last Divine Liturgy was served in Aghia Sophía (Άγια Σοφία) in Constantinople on Tuesday 29 May 1453. But it was disrupted by the Ottoman slaughter of all who were present in the Great Church that day. 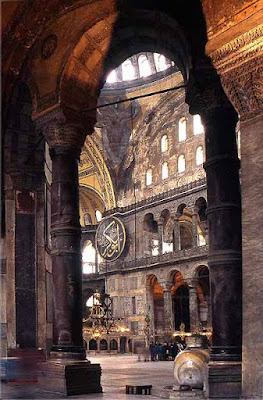 Aghia Sophia was the cathedral of Constantinople until it was captured and desecrated by the Ottomans in 1453. It was then turned into a mosque and became a museum in 1935. Since then, all worship, Christian or Muslim, has been prohibited there. There are many Greek legends about the Fall of Constantinople. It was said there was a total lunar eclipse on 22 May 1453, and that it was seen as a harbinger of the fall of the city. Four days later, the whole city was covered in a thick fog, which is unusual at this time of the year in the Eastern Mediterranean. When the fog lifted that evening, a strange light was seen above the dome of Aghia Sophia, and from the city walls lights were seen far out to the West, behind the camp of the besieging Turks. 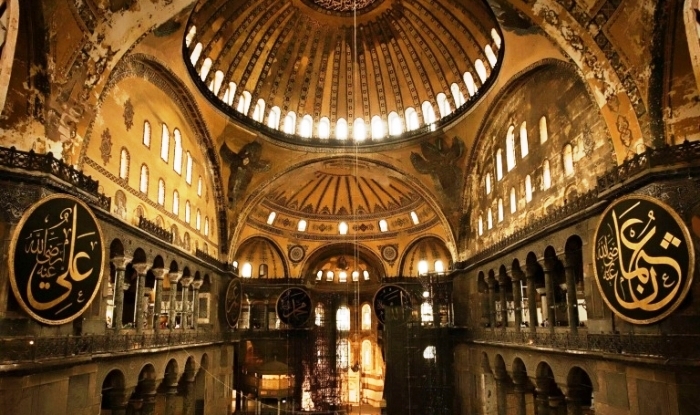 Some people who saw it interpreted the light around the dome as a sign of the Holy Spirit departing from Aghia Sophia. According to tradition, the Divine Liturgy in Aghia Sophia on Tuesday 29 May 1453 was being served by two priests, one Orthodox and one Roman Catholic, as Constantinople fell to the besieging Muslim forces. When the Ottoman invaders approached the altar, the south wall of the church is said to have opened at the touch of an angel and at his direction the priests miraculously passed through the wall, with the Holy Gifts in their hands. The door that had appeared in the solid wall closed behind the priests and reportedly will not appear again, nor will it opened again, until the interrupted Divine Liturgy can be resumed. It is said that when that day comes, the priests will re-enter through the same doorway through which they disappeared. A similar legend says that when the Ottomans entered the city, an angel rescued the last emperor, Constantine XI Palaeologus, turned him into marble and placed him in a cave under the earth near the Golden Gate. There he awaits being brought to life again. κάθε καμπάνα καὶ παπάϛ, κάθε παπὰϛ καὶ διάκοϛ. κι’ ἀπ’ τὴν πολλὴ τὴν ψαλμουδιὰ ἐσειόντανε οἱ κολόνεϛ. γιατὶ εἶναι θέλημα Θεοῦ ἡ Πόλη νὰ τουρκέψῃ. Ἡ Δέσποινα ταράχτηκε καὶ δάκρυσαν οἱ εἰκόνεϛ. a priest for each bell and a deacon for each priest. and from the volume of the chant, the pillars were shaking. ‘Stop the Cherubic hymn, and let the holy elements bow in mourning. for it is the will of God that the City fall to the Turks. The Virgin was distressed, and the holy icons wept. The references in the poem to the numbers of tocsins, bells, high priests, priests, and deacons do not reflect historic reality. On the other hand, the Greek in this poem, interestingly, has just one word to express the phrase “fall to the Turks” – τουρκέψῃ (turkepsi!). The poem achieved great popularity during the Greek War of Independence and may have been the most popular demotic song among Greek-speakers in the 19th and early 20th century. The song became the anthem of the so-called Megali Idea (Μεγάλη Ιδέα), and its emotional themes were echoed in influential literary circles. Nikos Kazantzakis made it the climax of his play Constantine Palaeologus, which he wrote in 1944 while Greece was under Nazi occupation. The reference to the Virgin Mary at the end of the poem as Κυρά Δέσποινα is interesting today as 15 August is the Feast of the Dormition in the East (Greek: Κοίμησις Θεοτόκου, Koímēsis Theotokos), or the Assumption in the West, and today is the name day for Greek women with the names Maria and Despoina.